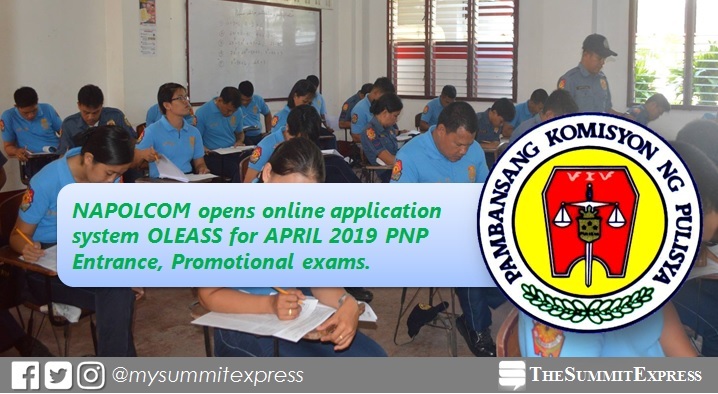 MANILA, Philippines – The National Police Commission (NAPOLCOM) opens today, January 28 the Online Exam Application Scheduling System (OLEASS) for the applicants of April 28, 2019 (Sunday) PNP Promotional Examinations. See online application form link here. According to the commission, applicants shall utilize the OLEASS to request the Regional Office for their schedule on the filing of examination application. Applicants will personally appear at the NAPOLCOM Regional Office on the date assigned to them, with their printed on-line confirmation letter and other required documents, for further evaluation. “Since the April 2018 NAPOLCOM examinations, the Commission has been implementing the enhanced OLEASS which now has features for on-line filling up, submission and printing out of an electronic application form to expedite the processing of exam applications,” NAPOLCOM Vice-Chairman and Executive Officer Atty. Rogelio T. Casurao said. The PNP Entrance Examination is open to all Filipino citizens who are not more than 30 years old and bachelor’s degree holder. Police Officers I (PO1) whose appointments are temporary for lack of appropriate eligibility are also required to take said entrance exam. Period of On-line Application Scheduling for the PNP Entrance Exam: January 28-February 1, 2019 (the system will be available at 12NN January 28, 2019 onwards). Period of On-line Application Scheduling for the PO Exam: February 4-8, 2019 (the system will be available at 12NN February 4, 2019 onwards). Period of On-line Application Scheduling for the SPO, INSP and SUPT Exam: February 11-15, 2019 (the system will be available at 12NN February 11, 2019 onwards). 2. Fill out the mandatory form and click SUBMIT. 3. Print out the on-line Schedule Confirmation. 4. Check your e-mail account and access the link for the Application Form. Fill in all the required details, send SUBMIT and PRINT OUT a hard copy. 5. Bring printouts of the Schedule Confirmation and filled-out Application Form to the NAPOLCOM Regional Office on the scheduled date for filing of the examination application. period of filing of application is from February 18 to March 15, 2019. (5) birth certificate in security paper issued by the Philippine Statistics Authority (PSA) or certified true copy of the birth certificate issued by the Local Civil Registrar and duly authenticated by the PSA. For a PO1 with temporary appointment, a certified true copy of Attested Appointment, Plantilla Appointment or Special Order is also required for submission. NAPOLCOM exam will be administered in all regions nationwide. For the entrance exam, OLEASS shall allow the applicant to choose the exam center where he/she wishes to take the examination, regardless of the place of residence. For the promotional exams, test center shall be automatically assigned by the computer system based on home address or unit assignment address provided by the police applicant. Check out details of test centers, what to bring on exam day, coverage of exam and other important announcements here: PNP Entrance | Promotional Exam. Once you've given the green light to take the examinations, the next thing after taking the exam is to wait for the April 2019 NAPOLCOM results. We advise examinees to closely monitor The Summit Express and our social media pages Facebook and Twitter for the updates.